Jamaica Tallawahs are top of the Hero Caribbean Premier League (CPL) after beating Barbados Tridents by five wickets at the Kensington Oval to make it five wins from eight. A third straight home defeat for the Tridents, meanwhile, leaves them facing an uphill battle to reach the play-offs as they paid the price for a top-order collapse that left them too much to do to get back in the game. The Tridents slumped to 55/5 against a fine all-round bowling performance from the Tallawahs, spearheaded by the superb Oshane Thomas, before Martin Guptill, Imran Khan and Ashley Nurse engineered a recovery to take the final score to 151/9. But that total was soon put in perspective by a swashbuckling 28-ball half-century for Tallawahs opener Johnson Charles. Although the Tallawahs’ innings slowed down for a while after his departure for 53 time was on their side and, despite a couple of alarms, they always appeared to have the chase in hand. The arrival of David Miller to the crease after Kennar Lewis fell for 8 saw a fresh injection of impetus as he dispatched Nurse for six then four in successive deliveries. Rovman Powell got in on the act, heaving two sixes and a four into the leg-side in the 14th over from Mohammad Irfan to take the required rate down to just a run a ball for the final six overs. The 15th over moved the game forward significantly for both sides as a snorter from Wahab Riaz flicked Miller’s glove on its way through to Nicholas Pooran before Andre Russell was run out four balls later. In between, Russell launched his first ball for six over square-leg and added a four to fine-leg from a free-hit. At the end of it all the equation was 24 from 30 but with only five wickets in hand. Powell was still going strong, though, and was joined by New Zealander Colin de Grandhomme to steer the Tallawahs past the Tridents total without further alarm and with 16 balls in hand. The Tridents were indebted to Guptill and the 60-run sixth-wicket stand he shared with Imran Khan to keep the game competitive in an innings where all seven bowlers used by the Tallawahs finished with at least one wicket. The Tridents were flirting with total disaster at 55/5, but Guptill finally found a willing ally in Khan and, aided by a rain break to clear their heads, the pair played sensibly and aggressively when possible to slowly but surely drag things back. 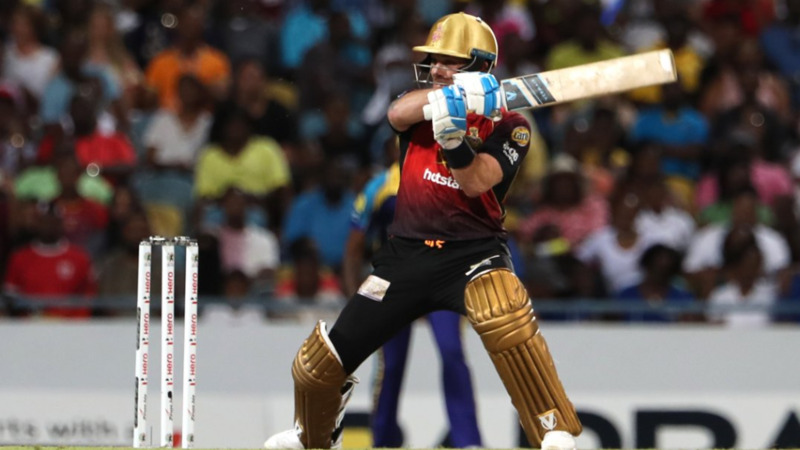 Guptill reached 50 in 41 balls on his way to 73 from 60, while Khan and Nurse – who hit Andre Russell for two fours and a six in the final over to lift the total beyond 150 – both added 20 in an innings where nobody else reached double-figures. Batting had been difficult against both spin and seam with the new ball on a pitch showing some uneven bounce, but the Tridents will still reflect on some self-inflicted wounds. Hashim Amla was leg-before attempting to sweep Samuel Badree before the ball of the night, and perhaps the tournament, ended Shai Hope’s stay at the crease. Oshane Thomas has been one of the 2018 Hero CPL’s standout performers, and he produced something close to unplayable with a rapid yorker that arced away from the batsman at the last moment to crash into middle stump. Thomas would later return at the death to rearrange the stumps once more, Wahab Riaz the victim this time. Steve Smith fell before the PowerPlay was out, playing away from his body against de Grandhomme and getting a bottom edge through to wicket-keeper Glenn Phillips. Worse was to come for the Tridents in the following over when a mix-up saw skipper Jason Holder run out by Charles’ direct hit from mid-wicket. Pooran fell soon after, carving Adam Zampa to long-off where Kemar Roach held a smart running catch. Serene through it all was Guptill, who hit four fours and three Hero Maximums – two of which cleared the stands – in an intelligent innings that combined aggression with stout defence in tough conditions. Khan played his part in the recovery, but when he and Guptill both fell to boundary catches in successive overs the Tridents were still short of where they needed to be despite a decent fightback and Nurse’s enterprising late hitting. Upcoming Fixtures: Thursday 30 August – St Kitts & Nevis Patriots v St Lucia Stars (6pm), Warner Park, Friday 31 August – Barbados Tridents v Guyana Amazon Warriors (8pm), Kensington Oval.